America’s 59 national parks are breathtakingly beautiful and incredibly diverse, encompassing wild seashores, towering mountains, dark rainforests, and vast deserts. Last winter, I had the honor of exploring Joshua Tree National Park, a harsh and varied ecosystem sprawling across 800,000 acres in Southern California. I’m not lying when I say there are endless opportunities for exploring in Joshua Tree with kids, and despite less-than-cooperative weather (snow! ), we did a lot of adventuring! In fact, I think it’s safe to say that Joshua Tree National Park is one of my favorite places in all the world. There’s magic in that desert, and I am already planning my next trip. In the meantime, I want to share some Joshua Tree National Park highlights, including the best hikes in Joshua Tree for families and an overview of Joshua Tree camping. Enjoy! The plants and animals in Joshua Tree National Park appear to be rugged and hardy, but in fact, they’re quite fragile. 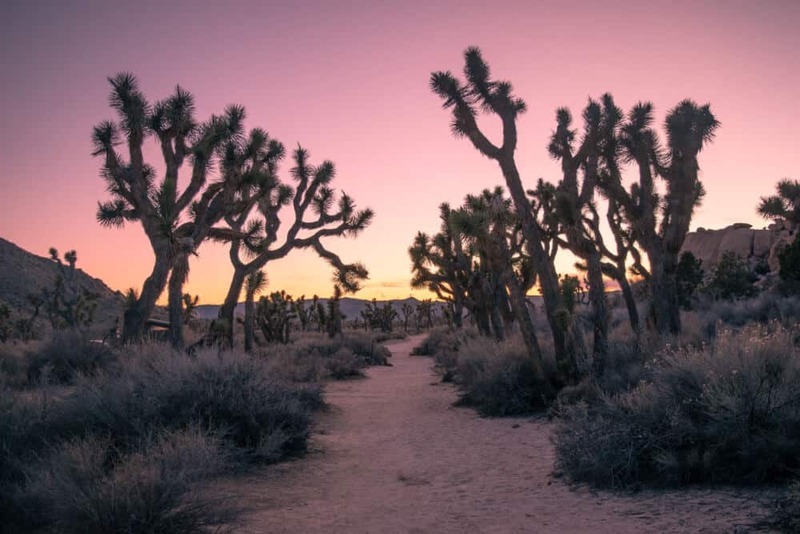 The spiny plants and slithery critters that live in Joshua Tree exist in an environment that teeters on the edge – requiring a perfect combination of just the right moisture, elevation, and temperature to thrive. As climate change and other risks to this delicate ecosystem take hold, the Joshua trees will most certainly disappear from the park, and this incredible landscape will exist only in our memories. Franklin D. Roosevelt proclaimed Joshua Tree a national monument way back in 1936, protecting land that most considered harsh and inhabitable. In 1994, Joshua Tree became the nation’s 54th national park. 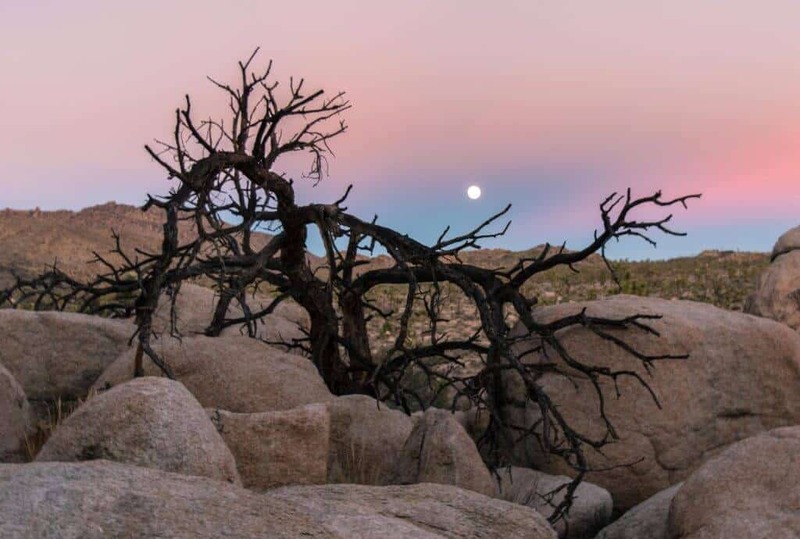 Joshua Tree National Park includes two distinct ecosystems. The eastern half of the park is part of the Colorado Desert ecosystem as well as the massive Sonoran Desert, which encompasses southern Arizona down into Mexico. 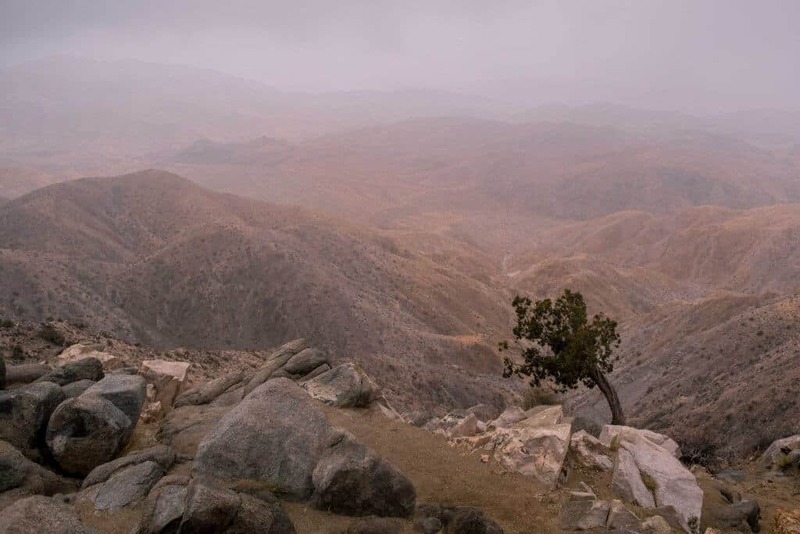 This hot, dry land exists below 3,000 ft. and is dominated by the creosote bush, a beautiful and surprisingly lush shrub that smells like rain and can tolerate extreme droughts. In the spring (late February or early March) this part of the desert is blanketed with wildflowers of every shape and color. The western half of the park encompasses the Mojave Desert habitat. This land is mostly located above 3,000 ft., and receives more precipitation than most desert ecosystems. The Joshua tree that dominates this part of the park might make you feel like you’ve entered a Dr. Seuss book or landed on another planet. These wild-armed trees aren’t really trees at all. They are a species of yucca (Yucca brevifolia), that has also been called the desert dagger. The name Joshua tree was probably coined by traveling Mormons, who believed that the tree resembled people raising their hands to the sky in prayer. The average lifespan of the Joshua tree is several hundred years old — the elders can are more than 500 years old, reaching heights of 35 feet or more! 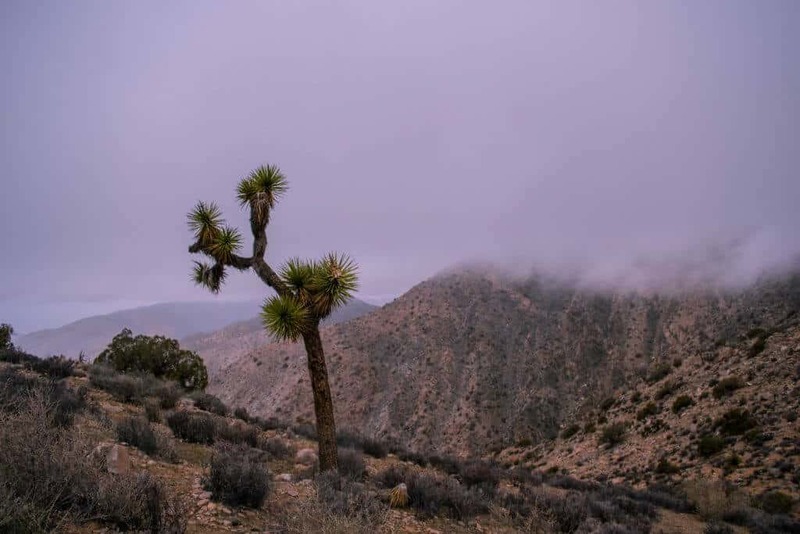 Joshua trees need very specific growing conditions — an elevation between 2,000 and 6,000 ft., plus above-average precipitation. As the risks and effects of climate change increase, it is very likely that these sentinels of the desert will disappear from the park, completely changing the landscape. 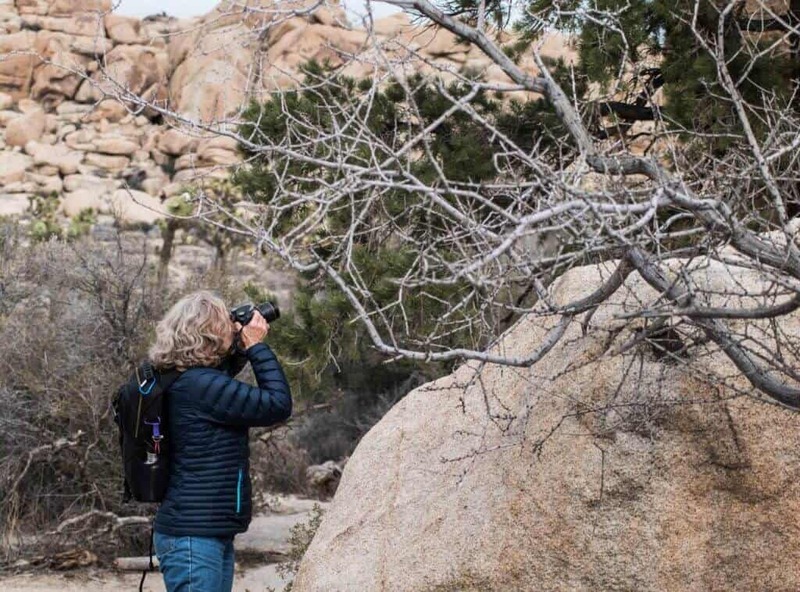 Photographer’s note: There are endless opportunities for photographing Joshua trees within the park. Some of the most exciting photo ops present themselves at night when the park comes alive, and the sky provides a spooky backdrop for the gnarly trees. Sunrise over Jumbo Rocks Campground. Jumbo Rocks Campground encompasses a surreal landscape in the heart of the park and has 124 campsites that provide ample space and privacy. You can’t make a reservation, but as long as you get to the park before noon, you should be able to score a site pretty easily. 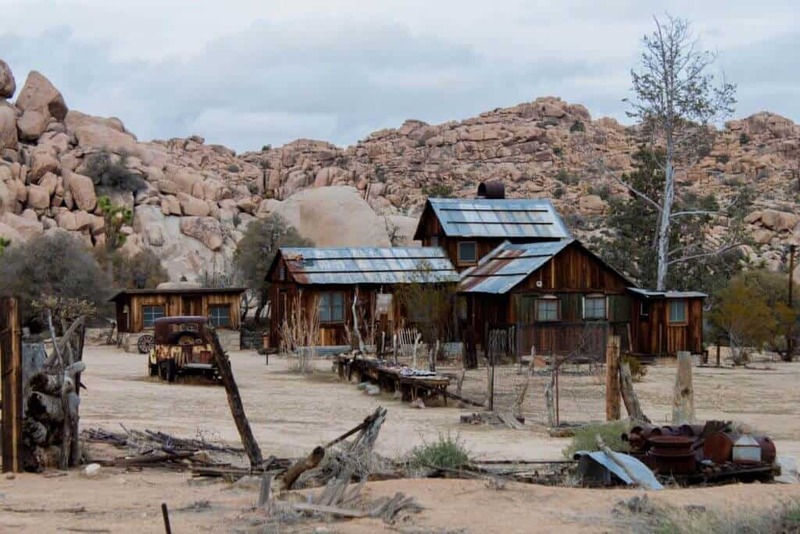 Most sites are spacious, nestled into the giant boulders and dotted with Joshua trees for privacy. The endless fields of boulders provide an incredible backdrop for photos, and adventurous kids (and adults) will love exploring the campground. Jumbo Rocks Campground is centrally located in the heart of the park. 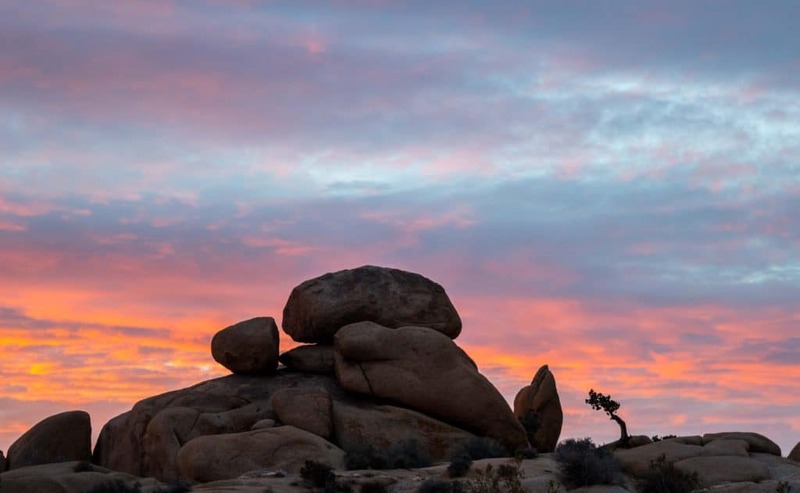 The Skull Rock Nature trail begins and ends in Jumbo Rocks, and many of our favorite Joshua Tree hiking trails and adventures are just a short drive away. The town of Joshua Tree (our favorite for eating out) is 23 miles away, and the town of Twentynine Palms is just 13 miles. We really loved sites #14, 15, and 16 in Jumbo Rocks Campground, but most of the campsites are equally awesome. There are a few reasons why you may want to choose another campground over Jumbo Rocks Campground. If the weather promises to be chilly through the night, you might want to pitch your tent in Cottonwood Springs, which is a good 10 degrees warmer than the more northern campgrounds. If running water is a necessity, choose Cottonwood Springs or Black Rock Campground. There is no running water at Jumbo Rocks Campground. We filled up several jugs at the visitor center. An important note: There is no firewood available in Joshua Tree National Park, so if you’ve got visions of campfires and s’mores dancing in your head, be sure to bring your own firewood into the park. You can buy bundles of wood at local gas stations and grocery stores. Joshua Tree National park has some of the best and most family-friendly hikes anywhere. 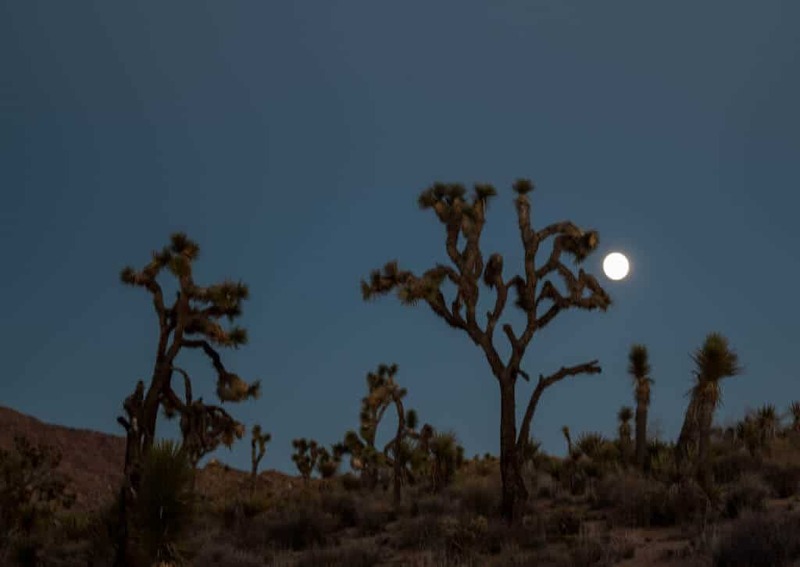 The following Joshua Tree hiking trails are relatively easy and fun for all ages. They are all under two miles and without huge elevation gains. If you’re an experienced hiker with older kids, I highly recommend the Lost Horse Mine Loop, which I’m not including in this list. All of these Joshua Tree hikes are located in the Mojave Desert section of the park, not far from Jumbo Rocks Campground. The Barker Dam trail is a beautiful Joshua Tree hike not far from Jumbo Rocks Campground. Skull Rock Nature Trail – 1.7-mile loop –This is a super easy and interesting hike that begins and ends at Jumbo Rocks Campground. 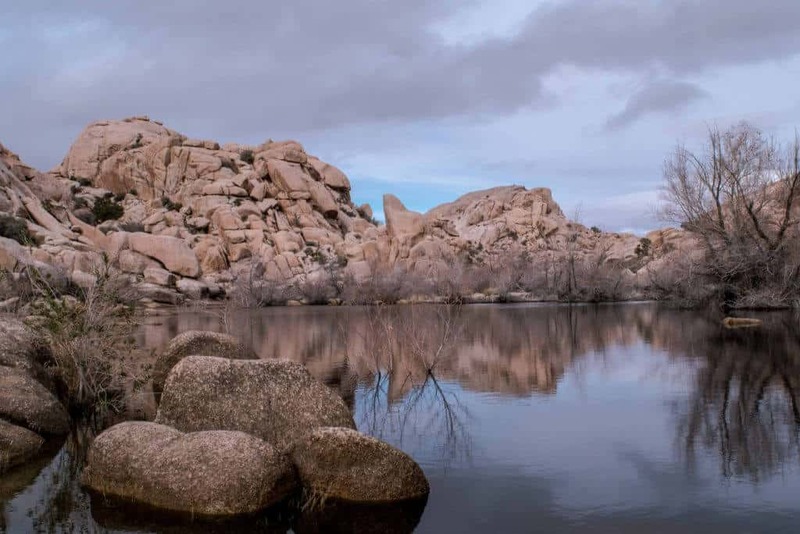 If you begin at the trailhead inside the campground and hike counter-clockwise, you will come to Skull Rock right away, cross the road, and then head through a large wash and meander among beautifully-sculpted boulders. Interpretive signs dot the landscape, and the kids will enjoy scrambling around on the rocks. The trail ends (or begins) right outside the campground entrance. Live Oak Loop – .9 mile loop -This great little loop is full of cool rock spires and other formations, with lots of nooks for exploring. The trail gets its name from the giant (and rare) live oak tree nearby. Pack a picnic for this one, and spend some time discovering the Mojave Desert. Barker Dam Loop – 1.5-mile loop – This is another favorite! It travels through the southern edge of the Wonderland of Rocks, weaves through narrow rock corridors, past a seasonal lake, and into a beautiful valley surrounded by boulders. 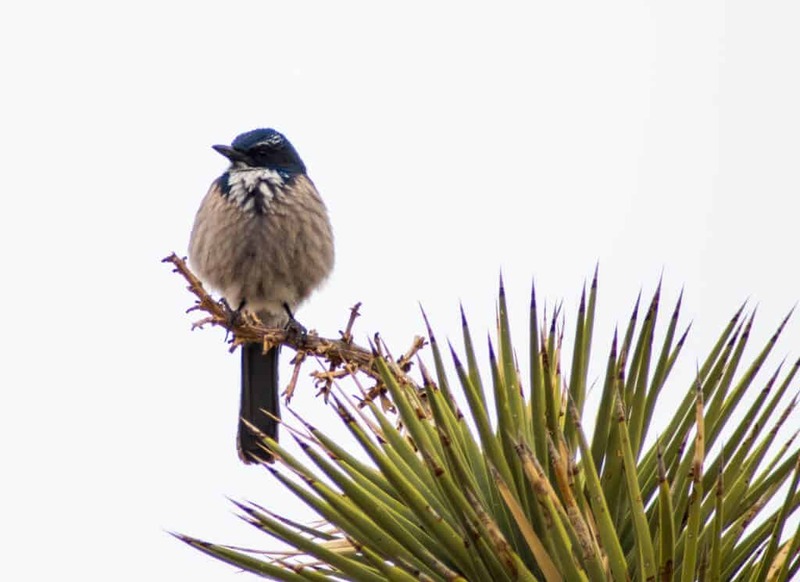 Because this is one of the few places where you’ll find water in Joshua Tree, there’s also a good chance that you’ll see some wildlife. Bighorn sheep are common, as are ravens and songbirds. A short spur trail leads to some petroglyphs on the rocks. Unfortunately, the petroglyphs were painted over with bright colors by a film crew back many years ago. Hidden Valley Nature Trail – 1-mile loop – Explore an enclosed valley lined with huge boulders in an easy hike that is suitable for the smallest kids. Hidden Valley is ground zero for the hundreds of climbers that visit the park each day in the cooler months. Be sure to venture into the verdant canyon, which is just off the trail. Cattle rustlers used to hide their cattle in the canyon, which is covered with dense foliage amid the towering cliffs. Wall Street Mill Trail – 3 miles (out and back) – Saving the best for last, this was our favorite hike (more like a walk) in Joshua Tree National Park. The trail contains all kinds of relics from the defunct Wonderland Ranch, making it a must-visit spot for photographers. Once upon a time, the Wall Street Mill was the fastest and most modern gold stamp mill in the area. It has been fabulously preserved. Explore the area, and you’ll discover a few old cars and crumbling buildings. Kids love exploring here, and the Joshua trees are incredible along the trail. I couldn’t do a write up on Joshua Tree National Park, without including a bit about sunrises and sunsets. In all honesty, wherever you are in the park, you’re probably going to a see a fantastic sunrise or sunset, but these are my favorite spots, especially for photography. Jumbo Rocks Campground – Those huge rock formations are good for more than a wind screen. Make your best camp coffee, and scramble up the boulders just before sunrise for incredible morning views. I particularly like the area around the amphitheater for photography. Key’s View – We stayed at a little motel just outside the park one night, and the owner insisted that we had to watch the sunset from Keys View. You can see for hundreds of miles if there’s no haze from pollution, and the view is truly stunning. It was cloudy when we explored the area, but this really is the spot for sunsetting. No hiking required here. There’s even a wheelchair accessible viewing platform. Barker Dam – Because this is one of the only spots in the park with water, it’s a great place to catch the sun’s reflections as it sinks behind the boulders. If you catch the sunset at the lake, you should have plenty of time to get back to your car before dark. Cloudy sunset from Keys View. Better luck next time! These aren’t exactly hikes, just some little adventures that you shouldn’t miss, with our without kids. The Keys Ranch tour is well worth the hassle – I promise! Keys Ranch (Desert Queen Ranch) Tour – Aside from our hiking explorations, this was the highlight of our visit. You have to take a guided tour to see Keys Ranch, and it’s only available on Thursday, Friday, and Saturday at 2pm. To make matters more complicated, you have to buy your tickets between 9 and 12 at the Oasis Visitor Center the morning of your tour. It’s totally worth it. Keys Ranch is a gem of a place, with lots of interesting history. It’s been expertly preserved and the ranger who gives the tour is funny and engaging. The only caveat is that it’s 1.5 hours of walking and talking, which might be hard for some kids. I’d say it’s good for 10+. If they really love history, maybe a bit younger. Intersection Rock – This is the most famous rock in all of Joshua Tree, and there’s no better place to come and watch the rock climbers! It’s right in the heart of Hidden Valley, and you can watch the climbers right from the parking lot, or take a little tour around the behemoth and stretch your legs. The climbers were so much fun to watch, and we also saw a coyote. Cholla Cactus Garden – Located in the southern part of the park, this is a fun place to see lots and lots of those fuzzy teddy bear cactus plants, and it gives you a good overview of the Colorado Desert habitat that we have scarcely touched on until now. Ocotillo Patch – After you visit the Cholla Cactus Garden, head south on Pinto Basin Road and visit the Ocotillo Patch. These are my favorite cactuses, with long, spiny arms reaching toward the sky. They’re full of red flowers in the spring, but beautiful any time of year. Cactus, Joshua Trees, and Yucca Plants — In the desert, children should be taught not to touch the plants they come across. A good number of them have been designed to protect themselves with spines, thorns, and prickers. Remember that the Joshua tree is also called the desert dagger? That’s because those leaves can cause serious damage. Many yucca plants grow right at eye-level for youngsters, making them even more dangerous if kids walk into them. Poisonous Snakes – Rattlesnakes, scorpions, and black widow spiders are active in the park. On warm days, you can find snakes sunning themselves across roads and trails. Remind your children not to reach into rock crevice where these critters may be hiding. Visiting Joshua Tree in the winter months (late November through late February) will definitely minimize your chances of running into these critters. Dehydration and Sunburn – This is perhaps the greatest threat in Joshua Tree National Park. There is very little water available at the park, so it’s important to be prepared. A gallon of water per day per person is recommended for adults — half that for kids. Be sure to encourage your children to drink up, even if they’re not thirsty. Sunglasses, hats with brims, and high-SPF sunblock is recommended, even in the winter. Mine Shafts – There are still open mine shafts in Joshua Tree National Park. These should never be entered! 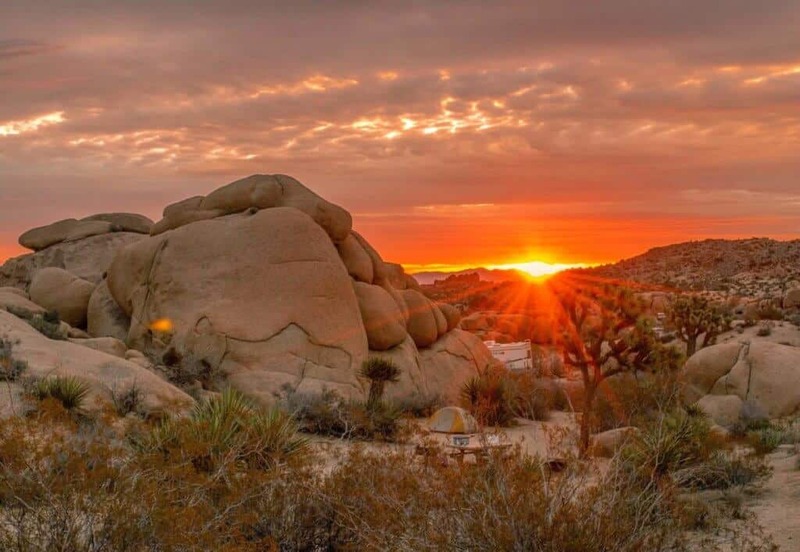 Joshua Tree National Park is open throughout the year. The entrance fee is $25 per carload, which is good for seven days. I don’t recommend bringing your dog into Joshua Tree. They’re allowed in the campgrounds and on the roads, but not on any of the trails — not fun for dogs or their humans. Camping at most campgrounds is $15 per night. If you’re camping at one of the few campgrounds with potable water, the price goes up to $20. Weather in Joshua Tree National Park can be pretty extreme. Spring and fall are probably the best times to visit, with warm days and cool nights. Wildflowers make their big debut in late February through the middle of March, and the tarantulas come out to mate in October. Winter can get cold, especially for camping, and snow in the higher elevations is not uncommon (but more uncommon than 10 years ago!). Summers are HOT, and extra precautions are definitely needed to hike safely. Joshua Tree National Park is definitely in my top three national parks, along with Theodore Roosevelt National Park and Olympic National Park. I’m envisioning a lifetime of exploring this place, so if you’ve got any additional tips, please drop them in the comments! Oh, and if you’re on Pinterest, can I convince you to pin this post? Please? Amazing. Its a great place to spend quality time with our family. Joshua Tree was my best. What did you love the most about this place? So hard to choose, but I really loved the surreal landscape, and also visiting Keys Ranch. WOw! Really great place to spend time with families. Thanks for the information. Wow Tara, you took some really cool shots. It really makes me think Joshua Tree, I had always overlooked it as lacking foliage in the past but you really showed out its beauty! Wow I’d never heard of this place and now I feel like I have to visit. I haven’t been to any of these places and they are truly stunning in their own innate state. I like to immersed their and spend my day listening to the moutains sound and feel the fresh air. I will surely pen this on my bucket list. I’m not much of a camper but I would definitely spend a few days here (I would probably choose a campsite with running water though). Interesting fact about where the name Joshua Tree came from – they do look like they’re praising the sky! Lydia – no need to camp if it’s not your thing. There’s a whole lotta lodging around the park. From quirky roadside motels to super-fancy resorts. This looks like a perfect getaway for a family vacay. I love national parks and how educational they can be kids and adults alike. You always learn something new amidst nature. I like the Jumbo rocks campground – looks like the perfect base! Jumbo Rocks is the best, and yes, my kids learned so much from the ranger programs and just exploring the desert. The National Parks of America are indeed real gems and great national treasure. The wild beauty of these is really incomparable. Joshua National Park ls breathtaking, the sunrise is so hypnotic. Would love to get lost in this paradise some day. We are really lucky to have those national treasures! I do hope that our government will continue to protect our parks for future generations to enjoy. It’s the only time I can afford such a lovely view! As an American who hasn’t lived in the states since 2013, I’ve made it a POINT to visit as many national parks in the west as humanly possible when I find time to make a trip home be more about tourism rather than family time. I have some friends who live in California, and their pictures to Joshua Tree are always so spectacular – as are yours – and I’m sure they don’t even do it justice. Thanks for instilling that I gotta go there ASAP! Photos never do it justice, Laura, but thanks for your kind words about my photos. Definitely one of the most beautiful parks I’ve ever been to! I absolutely love national parks and Joshua Tree has been on my list for quite some time now. Thanks for this amazingly thorough guide — I’m definitely pining it for later! You’re very welcome, Shem – and thanks for pinning! We just went to Joshua Tree for the first time last week actually! We loved it! We only had a few hours to drive through, I would love to go back and do some camping! The information you provide is great and the photos are incredibly beautiful! It really makes me want to go back and take the time to do sunrise and sunset photos! Driving through is pretty amazing as well, but you’re right – there’s a lot to see between sundown and sunrise. First, your pictures are incredible! I’ve only ever driven through Joshua Tree, but I completely agree about the “Dr. Seuss book” feel to the place. Andy loves hiking through there (although definitely not in the summer), and there is an AirBnB/VRBO world that really puts you in the middle of things even if you don’t like camping. I’d love to go out for a long weekend in the early Spring and spend some time there! Thanks, Patricia! There are lots of places to stay for folks who don’t want to rough it. In fact, we had a couple of really cold nights where we packed up and stayed in Twentynine Palms. It wasn’t high on my list either, Anne – just close enough to Las Vegas to make me want to visit. So glad I did!! I am a huge fan of Joshua Tree. I visited for the first time a little over a year ago and loved it. I didn’t get to camp in the park, so I’m hoping to do that when I get a chance to re-visit. I had no idea that the average lifespan of a Joshua tree was several hundred years old! They’re magical trees, aren’t they? Can’t wait to go back next year!